For UConn Huskies fans, sleep will need to wait. The past two nights of wins by men’s and women’s basketball secured both teams a chance at the national championship. Sunday’s win against Stanford by the women’s basketball team means they will seek an unprecedented ninth national championship Tuesday. They join the men’s basketball team, which had just the night before earned its spot in tonight’s game by knocking out Florida. 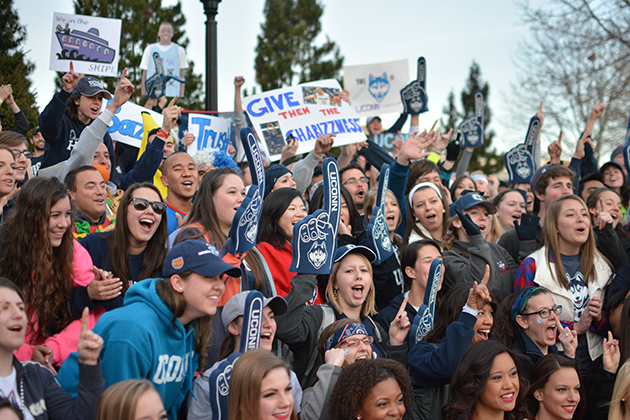 Even after fans had logged several late nights watching games, a contingent came out to Gampel in the early morning hours on Monday to demonstrate their support for the Huskies on live television. Tonight, fans will return to Gampel Pavilion to watch the live broadcast of UConn men’s basketball team play for its fourth-ever national title against Kentucky at AT&T Stadium in Texas, starting at at 9:10 p.m. Doors open an hour before the game. The Women Huskies will face Notre Dame in Nashville, Tenn., at 8:30 p.m., April 8. It will be the first women’s national title game between unbeaten teams.